These are pretty simple to make after you plan it. You'll need a somewhat heavy fabric and a light weight fabric. I used a lighter weight vinyl and a cotton print. Layout the stuff you what to put inside the pockets and leave about an inch between each item. For thicker items, like my cell phone, I left about an half inche extra to one side. Measure this total length and make sure to include a half inch on each end. Here ot was 18 inches in the photo. For the height, this is your choice. I picked the height based on my shortest object, the cream bottle. For the bottom purse pockets, I made the front slightly shorter than the cream bottle and added an inch to get the back. So, the cream bottle is 3.25 inches tall, the front is 3 inches and the back is 4 inches. Add 3 & 4 and it's 7 inches. Now, add the seam allowance to the height and the width and cut out the two piece of fabric. With right sides together, sew three sides together and turn right side out. Sew the final side together and top stich if you want to. Fold the bottom 3 inches (or whatever your front measured) up to form a big pocket. 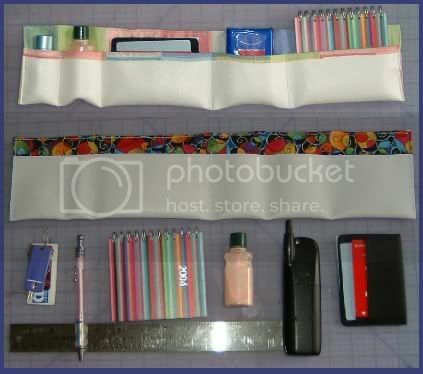 Sew on the ends and then sew the individual pockets to hold your stuff. Both of these photoed are made that way except I added a trim piece to the top one. Wow... That was fast! Thank you soo much for the directions. I'll post pictures when I finish making mine. Thats is neat ... I don;t sew put I could prob do this with glue & lots of carful clamping. So do you make that so it pulls out of the purse? Pretty much. I use it in most purses for just quick changing to a new purse and to keep all my small stuff in place. I bet I can make that! very smart, swank idea! i'm lovin' it! rock on, that is an awesome idea! I Buy D.I.Y , get listed! wonderful! i need to make one for my mom! She looks too pure to be pink! Thanks for the directions! Here's my purse-ket copycat!